Lionel Messi is arguably the biggest current name in soccer. The speedy Argentinean forward is a fan favorite and despite somewhat limited cardboard options, remains one of the top choices for soccer collecting, along with Cristiano Ronaldo and Pelé. The only thing that keeps him from staking his claim as the top player of all-time is his lack of World Cup success. Regardless, his individual and club success puts him among the legends of the sport and Lionel Messi cards enjoy considerable interest in the hobby. While he has already had a rather lengthy professional career, which began in 2003 with Barcelona, collectors looking for Lionel Messi cards will not find that many options, especially from his first decade. 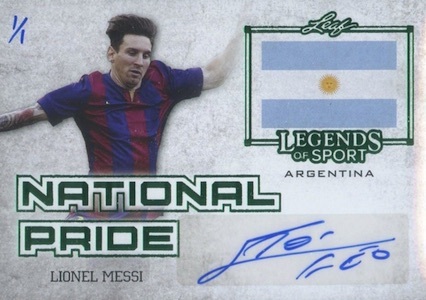 Values remain strong for key cards and collectors naturally gravitate to the earliest Lionel Messi cards, which were released in 2004-05 products, as well as his low-numbered options and autographed cards. Pack-pulled and certified autographs still remain elusive, but 2013 Icons Messi and 2014 Panini Prizm World Cup both boast signed cards for the scoring machine. More have been added in 2015 releases. Like his certified autographs, event and game-worn jersey cards for Messi remain sparse. 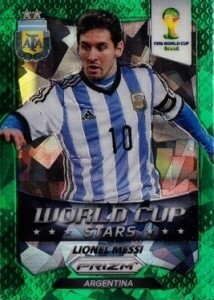 Collectors can find Lionel Messi jersey cards in several editions of Futera, as well as 2013 Icons Limited Messi Collection. 2015 Select offers the most plentiful relic options. The list below documents all the most notable options for Leo Messi. This includes his top early cards and most of his signed cards. For a detailed look at all the key early cards for Lionel Messi, as well as an apparel guide, view our Lionel Messi profile. 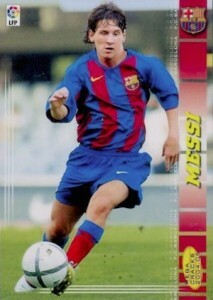 Easily the most valuable of the Lionel Messi rookie cards, 2004-05 Mega Cracks has seen a tremendous increase in value. In particular, high grades can command huge sums. 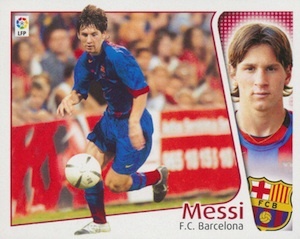 While stickers are normally less valuable and less popular, especially with modern cards, Lionel Messi's 2004-05 Panini Este sticker is considerably more rare than most of his other first-year cards. Collectors have certainly taken notice of this and pushed values quite high. 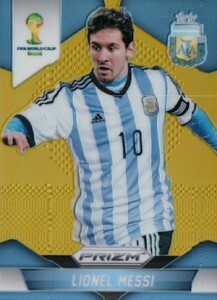 The first major release of a certified, pack-pulled autograph for Lionel Messi came in 2013 Icons Messi Collection. Broken into two versions, the limited edition boxes offer autographs and game-worn and event-worn jersey cards, while the basic retail version only includes base cards. The rare premium product was only available in Japan and Lionel Messi autographs fall about one per case. Despite several unimpressive card designs, the main draw is the large on-card signature. 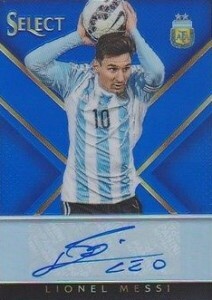 In total, there are five different Lionel Messi signed cards found in the product. Refractor-mania is nothing new for North American collectors, but Prizm World Cup is among the first products to bring an extensive checklist of the shiny parallels to international soccer. The full group includes 11 different parallels, and collectors have shown a considerable interest in the rarest options, including Green Crystal Prizm (#/25), Gold Prizm (#/10), Gold Power Prizm (#/5) and Black Prizm (1/1). 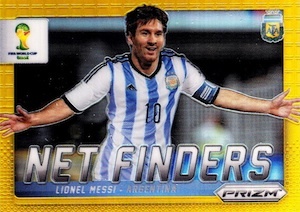 Because Messi is featured in multiple inserts (Net Finders, Matchups, Stars) and the base set, there are actually 48 different Lionel Messi cards to collect, including the non-Prizm versions of each card. If you include the Team Photos inserts for Argentina, that adds 12 more cards, for a total of 60 different Lionel Messi cards. 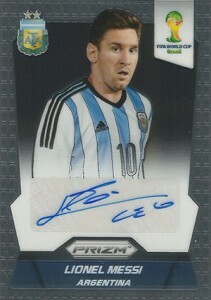 While it is not the first certified Lionel Messi signed card to emerge from a pack, the Lionel Messi autograph is one of the most popular cards in the entire Prizm World Cup product. In a perfect world, this would be signed on-card, but other than that, this is an awesome card. Rare Prizm parallels add further intrigue and are numbered to just 25. In addition to a variety of base, inserts and parallels for Messi in 2015 Donruss, collectors can find a limited autograph in The Beautiful Game insert. 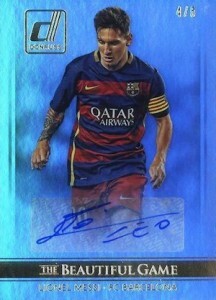 The card features Messi in his FC Barcelona kit with a sticker autograph. Although it does not showcase team logos, the Triple Autograph in 2015 Leaf Legends of Sport offers a powerhouse trio. 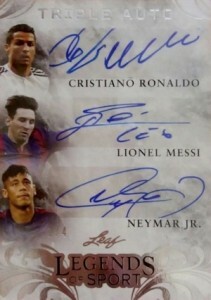 Messi is joined by Cristiano Ronaldo and Neymar with autographs on the same card. 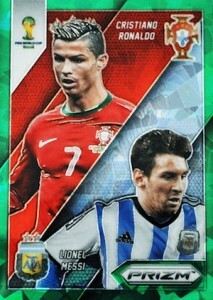 Messi also has several single-signed cards in the multi-sport release. 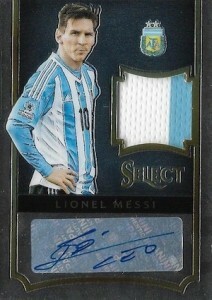 Another popular option from Panini, 2015 Select offers the first autographed relic card for Messi. Limited to 46 copies for the base version and some rare parallels, there is also a basic autograph as well. LIONEL MESSI ARGENTINA SOCCER 2018 PANINI FATHERS DAY ICE GAME JERSEY #05 25 !! I think that the mega MVP of messi from the mega cracks 2012-13 is quite rare, because I found that there are almost nobody sells it in the internet, isn’t it? 2018 Panini Eternal Magnificent Moments Autograph Lionel Messi 17 25!